Although BBlog has stopped development, it is still possible to install it in your browser! First of all I want to thank the BBlog developers for their awesome work over the years. Their plugin made huge improvements on the Battlelog platform and made playing the games using Battlelog way more enjoyable for many. While development may have stopped, the BBlog developers made their work and plugins available on GitHub. For Chrome users the BBlog plugin is still available in the Chrome plugin store. Firefox users can download the plugin file here and then install it manually. This can be done by pressing the button with 3 stripes in the right corner of your Firefox browser (picture) --> Clicking the Add-ons tab --> Clicking the small gear icon (picture) --> selecting the .xpi file you just downloaded in the explorer window that pops-up. What can I do with BBlog? Guide updated with fix for broken scoreboard on 17 june 2018, thanks @xfileFIN for making the TruePlayerCounts plugin and Battlelog fix! You can install a plugin that shows you the true amount of players on a server! This plugin will also fix the broken live scoreboard on server pages. After installing the browser plugin and restarting the browser, go to Battlelog and hoover your mouse over the new slider that appears on the left side of your screen. People that were already using BBlog and experience Battlelog freezes since +/- 15 june 2018, start the TruePlayerCounts tutorial here!. New users can continue with this tutorial. Press enter and refresh your browser. You are all done now! After I cleaned my browser cache and / or used a program like CCleaner, the plugin is gone? BBlog is stored in browser memory. So it could happen that after you did a browser cleaning, some plugins you added to BBlog are gone, or even BBlog itself is gone. Follow the steps again to re-install them. List can be expanded. List your problems in this thread. Installing BetterBattlelog and TruePlayerCounts, the right way. 1. Which browser you want to use? For Chrome, continue to 1a. For FireFox, go to 1b. 1a (Chrome): Install the Chrome plugin via the Chrome plugin store. 1b (FireFox): Download the plugin file here and then install it manually. This can be done by pressing the button with 3 stripes in the right corner of your Firefox browser (picture) --> Clicking the Add-ons tab --> Clicking the small gear icon (picture) --> selecting the .xpi file you just downloaded in the explorer window that pops-up. 4. Hoover your mouse over the new slider that appears on the left side of your screen. (example below). 5. * The settings tab appears. 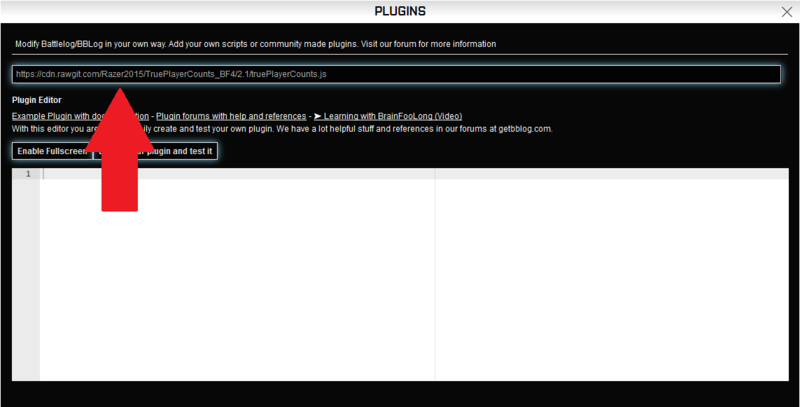 Click on the Plugins button within the settings tab of BBlog *(not the Plugin Gallery tab! Example below). 7. Press enter and refresh your browser. You are all done now! Thanks @xfileFin for this fix! Thanks @StarscreamUK for approving my post! How do you install this plug in? I am missing something. Read the 1st post again. There are links to Chrome and Firefox plug-ins. 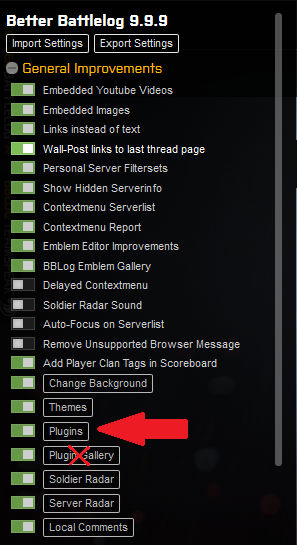 Once you enable it, there will be a side bar on your battlelog page. Need to update the original tutorial to include it. Will do that tomorrow. I think I have it now, thanks all. Tutorial updated aka copy pasted the fix to the first post. Haven't tried the fix yet, but thanks for taking the time for this thread. Edit: I'd also like to thank the creators of the plugin and the fix for the true player count. Glad some people still care about the game at this point. thanks for fixing this addon. Now it actually loads faster than before BBL died. Just cleared my browser history and BBL stopped working. Trying to figure out why. You need to re-add the TruePlayerCounts, stored in browser memory.